On March 29, 2014, there was a significant solar event where an x-class flare burst off the right side of the sun. Several NASA spacecraft, a ground based telescope and five observatories were tasked with studying the solar flare and the coronal mass ejection (cme). This NASA hangout/discussion includes Jeffrey Newmark from the NASA Headquarters; Adrian Daw who is the IRIS project scientist at NASA Goddard; Albert Shih, the RHESSI scientist at NASA Goddard; Sabrina Savage, the Hinode deputy project scientist at NASA Marshall and Lucia Kleint from the Bay Area Environmental Research Institute. 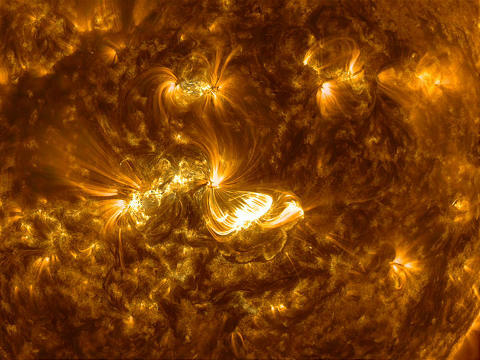 These scientists and researchers describe how multiple NASA and other organizations and missions worked together to explore the sun’s surface and atmosphere, providing us with some of the unprecedented images of the onset of a solar flare. This image was produced by NASA’s Solar Dynamics Observatory using a combination of two wavelengths, of extreme ultraviolet light. The end result is a stunning depiction of a X-Class Solar Flare and the associated Coronal Mass Ejection (CME) from the Sun. This X-Class CME which occurred on January 7, 2014 was directed towards the Earth, and may have resulted in bright auroras visible on certain parts of Earth when it impacted our planet’s magnetosphere. Thankfully it did not have any reported deleterious affects on the satellites in orbit or electrical systems and equipment on Earth. This X-class solar event was measured at X1.2. The “X” classification denotes a significant solar event in the overall scale, which goes from A, B, C, M, X and Z – in ascending order. Within each classification, the numerical value represents its strength on a linear scale, so this X1.2 CME would be quite low within the “X” class measurement. For reference, the highest recorded solar flare was an X28 but it is believed by some that the 1859 Carrington Event, may have been a X40 solar flare and CME, generating massive solar storms on Earth. Unless we are prepared for a similar event today, it could result in catastrophic failures of electronic/electrical systems and significant loss of life. This short film takes a number of high definition images of the Sun, taken by NASA’s sun-pointing semi-autonomous spacecraft – Solar Dynamic Observatory (SDO) – to provide this cool look at solar flares and storms.